Airmen from the 25th Operational Weather Squadron pose for a photograph at Davis-Monthan Air Force Base, Ariz., July 19, 2017. 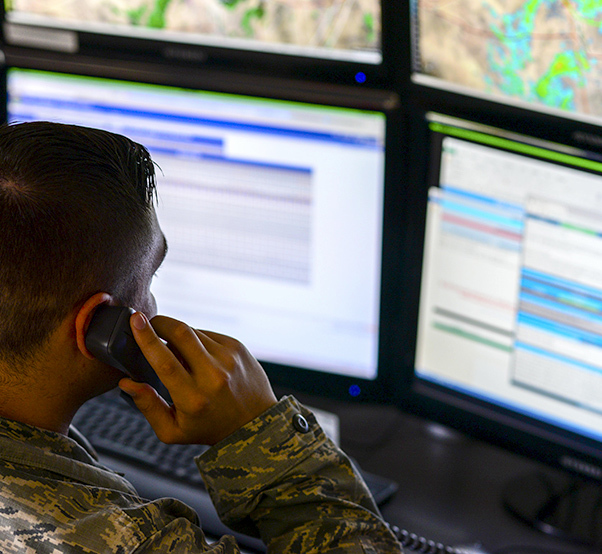 The 25th OWS works 24 hours a day and seven days a week by monitoring the base’s weather conditions and their potential effects on operations. 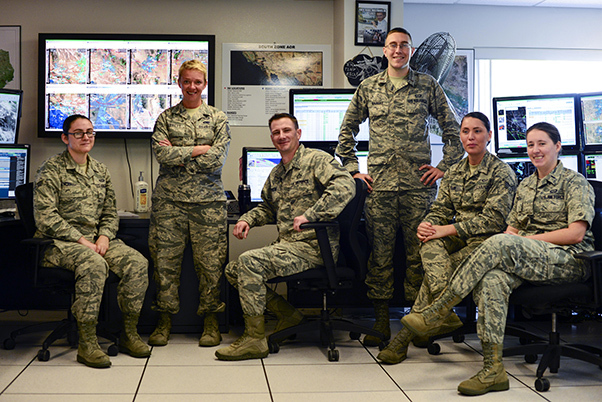 From late June to late September, monsoon season not only brings with it heavy rains and severe thunderstorms, but also sends a surge of personnel from the 25th Operational Weather Squadron at Davis-Monthan Air Force Base, Ariz., right to the unit’s operations hub. The 25th OWS adjusts its operations by taking into account the cyclic and predictable behavior of monsoon. 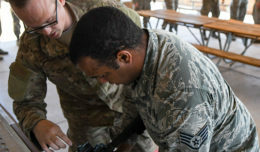 “We have extra workers on the floor during the day time and into the evening hours,” said Master Sgt. Ann Barrett, 25th OWS superintendent. Rain isn’t always the problem with monsoon season. Tech. Sgt. 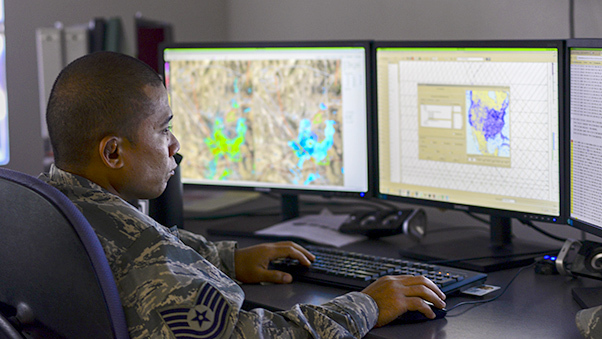 Ryan Mendiola, 25th Operational Weather Squadron weather forecaster, monitors weather data at Davis-Monthan Air Force Base, Ariz., July 19, 2017. 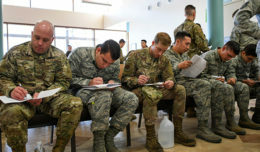 Forecasters from the 25th OWS monitor weather conditions for the western part of the Continental U.S.
“The biggest risk with the thunderstorms isn’t necessarily the rain, but the winds associated with them,” Leahy said. Both winds and lightning within close proximity hinder airfield operations at Davis-Monthan AFB. “Cross winds, which are winds that blow across the runway, instead of up and down the runway, anything over 15-25 knots can stop the A-10 operations,” Barrett said. While precautions exist, such as lightning within five miles, many times forecasters must decide whether or not to shut flying operations down, or proceed as scheduled. 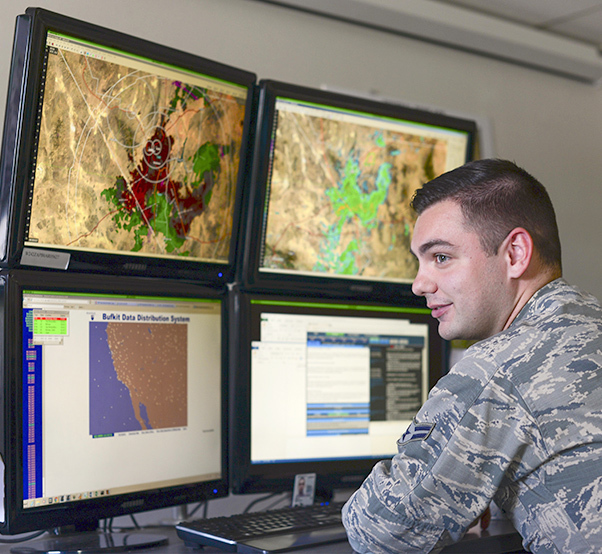 Airman 1st Class Cody Leahy, 25th Operational Weather Squadron forecaster, monitors radar at Davis-Monthan Air Force Base, Ariz., July 19, 2017. Leahy was monitoring base wind velocity and weather conditions of Nellis AFB, Nev. Despite the challenges and increased tempo during monsoon season, the 25th OWS remains busy year-round. After monsoon season is over, forecasters monitor the weather activity in the states of Washington, Idaho, Montana and Wyoming. Airman 1st Class Cody Leahy, 25th Operational Weather Squadron forecaster, answers a phone call at Davis-Monthan Air Force Base, Ariz., July 19, 2017. 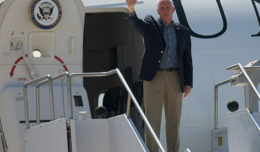 Leahy was responding to weather condition inquiries from Travis AFB, Calif.